No this post is not about breast reduction surgery, It is part admission and part redemption. Nearly a year ago. last November, I started building the odyssey known as The Anarchist's Tool Chest, and here comes the admission part. I made some mistakes. The "Unfinished" chest at work in the temporary winter shop I set up in our apartment. The Second mistake happened during the construction of the shell. It is slightly, oh so slightly out of square. Unless you measure it out you cannot tell. When recognized and planned for this should not be a problem and it really isn't, but it is a mistake and it did compound some further issues. Mistake three came as a factor of the first two. I built the lid square and a fraction undersized. First, square and unsquare do not match up perfectly well. Second I was trying to be so precise on my measuring, (the better to stretch my stock my dear) that the lid would not fit and allow a wrap around it without that wrap hitting on the sides of the shell. If I had been smart enough I would have built the lid over sized and planed it down to the proper fit. Square, un-square just would not have mattered. I admit I was at a loss as to how to fix the problem right away so I moved into mistake number four. I moved forward and built the interior of the chest, filled it with tools and started to work out of it. Once you have started using something like this it's tough to take it apart to finish it. There was a serious danger my version of the chest may have sat at 90% finished forever. This past week I changed all that. Lately I've been re-reading the book that inspired the build and with a lull in the shop I figured I had enough time to finish the build. So I set up a couple saw horses and emptied the chest's contents out onto a couple boards. The gift the last year had given me was time to devise a solution to my lid misfit. I took the lid off the hinges and glued 3/4" thick pine around three sides of the perimeter. I left the back alone, I didn't want to shift where the hinges attached. Since the lid stock is close to an inch thick, I had to face glue the pine on, I cut the boards oversize and planed them to match. Then I reattached the lid to it's hinges. Then I cut some strips of 1/4 thick birch plywood and hot glued them to the top of the shell. I wonder if you can guess what comes next? I broke out my Porter Cable router and a pattern bit. I know, it could be considered kind of shocking because of how I talk so much about hand tools incessantly, but after a lot of thinking I decided on this method as the fastest and most reliable. The bearing on the end of the bit rode around the case shell on the 1/4" plywood strips. After removing the strips this left me with a lid sized perfectly to the shell with a 1/4" overhang. From there I was able to start on the skirt and wrap. also in dimensional 1X clear pine. I got going by planing a chamfer, not a straight 45 degree chamfer, I offset it and removed 3/4" off the face and 1/2" off the edge. The process of wrapping a case like this takes a little while to accomplish. You don't want to try and do this by breaking out the measuring tape, you want to lay things out and take them right from the case itself. Measuring and cutting one corner at a time. The process is laid out thoroughly in The Anarchist Tool Chest. The upper skirt is accomplished in the same manner. It has the same chamfer on the bottom. And the top is wrapped on only three sides leaving the back without. Finally I had a dust seal and completed the build of the chest. Next up comes the paint. I'm going to do a white undercoat with a darker red overcoat. 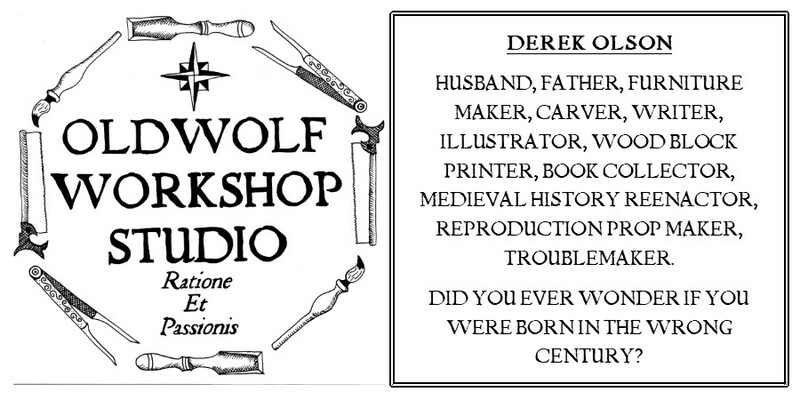 I'm thinking I may do an oval on the front with a stenciled in logo for the Oldwolf Workshop Studio. But as we are beginning the moving process here in the next week or two the paint job will have to wait until I get into the new shop. Until then I pushed the chest back in it's current home. At first I staged this shot as kind of a vanity set up, a little to plug Chris's book and a little to celebrate finishing the build, mistakes and all. After I got home and started editing the photos I realized something different in the picture. To the left of my ATC is the Old World Tool Chest my Father-In-Law gave me a while back. It currently holds a bunch of the odds and ends tools that came with it but it also holds my tools for green woodworking, splitting wedges, hewing axes, a froe and more. 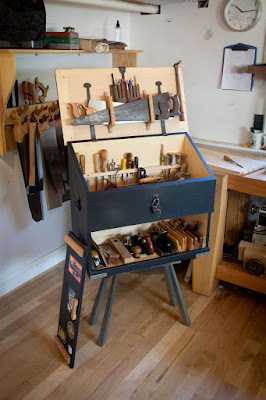 Getting this chest was my first inspiration for wanting to build a traditional tool chest like the one featured in The Anarchist's Tool Chest. I was inspired to start even before the book was published. I wrote a couple posts on the chest and you can find them HERE. I find it fitting that these two sit next to each other. Originally I planned to retire the heirloom chest once mine was in play, but it has spent it's whole life holding tools, I think it needs to stay holding tools. My chest is also out of square. It is close enough that I didn't stress too much. It is actually closer than I expected it would come out, but certainly wacky enough that the tills and lid needed some tweaking. I did allow my lid to be oversized enough to plane it down, yet I STILL messed up and made it too thin in a couple places. By rotating the whole thing, I was able to just fudge it, but some of the lid's dust seal is much thinner than I had wanted. Just saying you are not alone. Despite the flaws, my chest and yours are more than qualified to do their jobs; to protect tools, to organize and dispense them, and to serve as a wonderful building experience. Maybe like your original, they will even inspire somebody far in the future. It would be so cool to think of this chest as an inspiration at some point in the future.